Every work trip Ohio State Treasurer Josh Mandel took in 2016 was in some part related to politics, including his 2018 campaign for U.S. Senate, according to a financial disclosure statement submitted by the Republican politician and reviewed by The Associated Press. 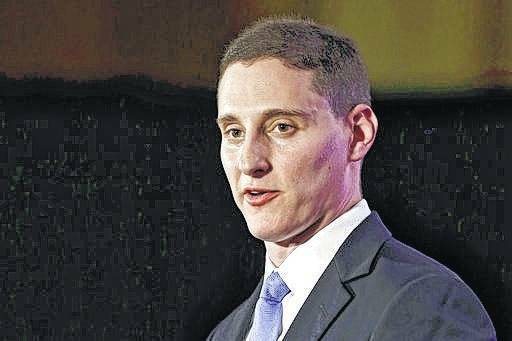 COLUMBUS, Ohio — Ohio State Treasurer Josh Mandel submitted a financial disclosure statement that reveals that every work trip he took last year was at least in some part related to politics, including his campaign bid for U.S. Senate. The filing reviewed by The Associated Press includes 23 pages of itemized travel for 2016 totaling more than $75,000, all covered by Mandel’s various federal campaign committees. Federal election law allows state officials running for federal office to use federal committee funds for travel only if it has a political component. Mandel, a Republican politician often criticized for being in perennial campaign mode, reported his travel expenses on his personal financial disclosure to the Ohio Ethics Commission last month. His Senate campaign spokesman Ethan Zorfas said Mandel’s official and political travels were merged to protect taxpayers from paying for anything political. The Treasurer’s Office declined an AP request to identify Mandel’s work-related travel expenses but confirmed that he did not charge either his office or his state treasurer campaign for any travel in 2016. Mandel met with Paul Nick, executive director of the state’s Ethics Commission, and was advised he was within Ohio law to “over-disclose” his travel spending without identifying specific state-related trips. The filing itself is so voluminous and convoluted that it’s virtually impossible to separate his campaign activity from whatever portion of the spending went to official travel. Included were spending by Mandel’s three federal campaign committees — JOSHPAC, Team Josh and Citizens for Josh Mandel Inc. — as well as $77,000 listed under Citizens for Josh Mandel that turns out to be a marriage of the other three and then some. Mandel characterized it as an act of “over-disclosure,” a hyper-transparency that goes beyond what’s legally required. But by submitting nothing but federal campaign reports as evidence of his travels as state treasurer, Mandel effectively acknowledged that he interwove politics into every trip he took last year. Sheila Krumholz, executive director of the nonpartisan Center for Responsive Politics, calls the disclosure one of the most “anomalous” examples of public reporting she’s seen. The dozens of payments to airlines, rental car companies, hotels, restaurants, gas stations and parking lots show that Mandel took 17 out-of-state trips in 2016 — to New York, Boston, Washington, D.C., Chicago, Las Vegas, Texas and Florida. Whether all, some or none of those trips involved business for the state of Ohio is unclear. Under federal election law, Mandel would be prohibited as a state officeholder from using the federal committees included in the report purely to cover official travel. Only federal officeholders are permitted to use federal funds to pay for their official activities. But there’s a loophole. As long as Mandel incorporates some campaign-related activity into each trip, the spending is allowed. Depending on the committee, that might include fundraising, campaigning or raising his national political profile. Krumholz commended Mandel’s stated goal of saving taxpayers money, but she said it’s one of the most unusual campaign finance arrangements she’s seen. Mandel’s salary as treasurer is $109,565 a year.